Please do not drive on the new Black Top for 48 Hours after installation in normal weather. Please do not be concerned with tire marks caused by parking and power steering, especially in confined areas, as further traffic will help heal this particular material. Please exercise care with bicycle kick stands, chairs, ladders, car jacks, etc., as any sharp projection may cause indentations on the new Black Top. The Black Top is subject to soil and temperature conditions, especially in Northern climates where weather changes are extreme. Expansion cracks are unavoidable, especially when resurfacing over an existing cracked base. Although every effort is made, we cannot guarantee perfect drainage in every situation due to local conditions. We recommend having your new Black Top sealed anytime after (30) thirty days from installation, or as the manufacturer of the product recommends. Sealer will help repel gasoline and oil spills which could damage the Black Top. Sealer will also prevent any flaking problems which are common in unprotected Black Top. The life of the drive is determined by the strength of the base it is built on. Paving over an existing weak base is at the owner’s risk. 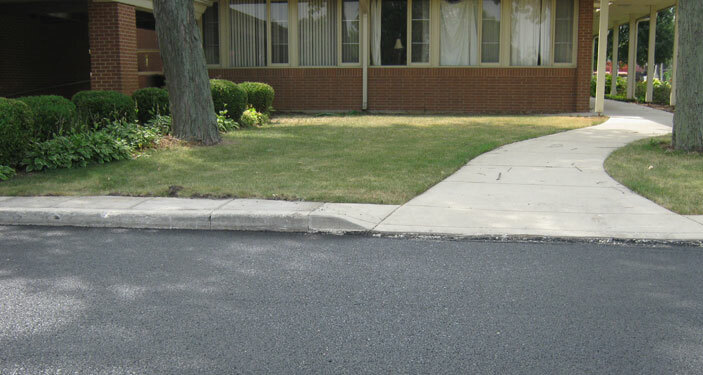 Residential driveways are made for cars, pick-ups, and light vans. Heavy vehicles may damage the driveway and is at the owner’s risk. All materials and workmanship meet or exceed the State of Illinois and local government requirements.